Calling all Unbreakable Flowers! 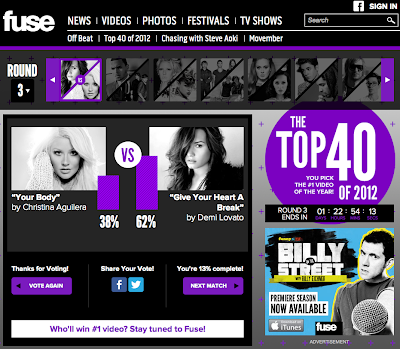 Christina Aguilera's music video for her hit single, 'Your Body', has made it to Round 3 in Fuse's battle for #1 Video of the Year. She knocked out two pop-tarts in the first two rounds. In Round 1, Katy Perry was putting up a great fight but it wasn't until the last couple mins that Christina came in swinging and came out victorious. In Round 2 Christina went up against Rihanna, to our surprise she didn't put up much of a fight. Christina came out of that round on top. But now it's a different story, in the beginning of Round 3 we had a 30% - 40% lead on Demi Lovato but as you can see in the the screen shot below, we had fallen way back. Make sure to spread the link for the poll on every social media platform you have (i.e. Facebook, Twitter, and Tumblr). know I am getting experience daily by reading thes pleasant posts. It's going to be finish of mine day, except before ending I am reading this impressive post to improve my knowledge. What's up, its good piece of writing regarding media print, we all be aware of media is a great source of information. Hi everyone, it's my first pay a quick visit at this website, and article is really fruitful designed for me, keep up posting these content. I don't recognize who you are but certainly you are going to a famous blogger should you are not already. Cheers! Great website. Lots of useful information here. I'm sending it to several friends ans additionally sharing in delicious. And naturally, thank you to your effort! Actually no matter if someone doesn't know after that its up to other people that they will assist, so here it happens.